Henley Royal Regatta, Henley on Thames, Oxfordshire. The Women's Four Hollandia Roeiclub, Netherlands vs. Vesper Boat Club and Princeton National Rowing Association, U.S.A. Photo by Peter Spurrier. Vesper Boat Club has tapped former California Rowing Club assistant Peter Mansfeld to lead its high-performance rowing program. Mansfeld brings several years’ worth of international experience to his new role, serving most recently as U.S. single sculler Michael Clougher’s coach for the 2017 worlds in Sarasota-Bradenton. Mansfeld’s coaching resume also includes stints with the German, Swiss, and Czech rowing federations. He arrives in Philadelphia following a very successful 2017 for the powerhouse club. In all, Vesper athletes accounted for an astonishing seven medals at last year’s world championships. For Anita DeFrantz, one race’s finish line is just the beginning of the next race’s start. 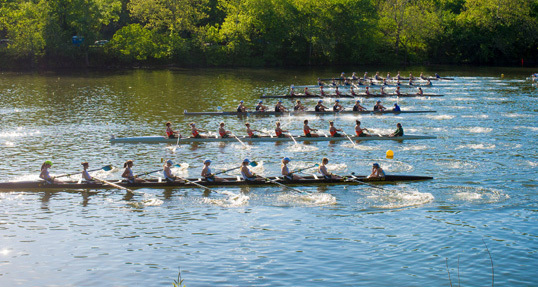 Ohio Wesleyan University adds women’s rowing as popularity in Midwest rises.